YF-8™ is an unique anti-aging, Human Growth Hormone (HGH) precursor supplement with benefits that include beautiful skin, cardiovascular protection, immune system support, improved sexual performance, increased energy, memory enhancement, weight (fat) loss, muscle increase and more. Suggested Use: One Serving Daily (Bedtime). Serving size = Four Capsules. Other Ingredients: Vegetable capsules. No Additives - No Animal* Products or Testing. Arginine is an amino acid known to be a growth hormone releaser. The decrease in the production of growth hormone is a major reason body fat tends to increase and muscle mass tends to decrease with age. Growth hormone itself cannot be taken orally because it is broken down in the digestive tract before it can get into the bloodstream. It is possible to obtain injections of Growth hormone, however it is extremely expensive. A good alternative is to take a growth hormone releaser such as L-Arginine. Arginine is also a nitric oxide precursor. Nitric oxide is the chemical secreted by the lining of the blood vessels that causes them to dilate. This determines which parts of the body receive extra blood flow, and which receive less. The effectiveness of Arginine is diminished if foods which have other amino acids, or that cause significant amounts of insulin to be present in the bloodstream, are eaten. Therefore, it's best taken on an empty stomach. Ornithine is also an amino acid. Ornithine is the most potent amino acid ever studied for stimulating the production of Human Growth Hormone. It functions as a muscle building hormone. It is best taken at bedtime, three or four hours after eating, in order to enhance the natural release of Growth Hormone that occurs approximately 90 minutes after falling asleep. Ginkgo Biloba Extract is obtained from the oldest living tree species. Its constituents have been used in traditional medicines for several thousand years. The key to Ginkgo's benefits lie in its ability to improve circulation in every area of the body, including the brain, thus improving mental performance. It helps blood vessels remain supple and elastic helping to protect against heart and circulatory problems. Improving blood flow allows nourishment and oxygen to reach every part of the body. In addition, it is an excellent free radical scavenger. Glutathione is a naturally occurring protein that protects cells from toxic free radicals and disease. It has been called the "master antioxidant," because it regulates the actions of other antioxidants like vitamins C and E. It regulates immune cells, and is probably the most valuable detoxifying agent in the body. The level of glutathione in the cells is one of the most predictive factors of life expectancy. The portion of a rose that is attached to the stem, after the petals have fallen, is known as the rose hip. Rose hips are one of the most abundant sources of Vitamin C. They contain up to 60 times the Vitamin C of citrus fruit, as well as the bioflavonoids necessary for the Vitamin C to be properly absorbed. Rose hips also contain vitamin E, vitamin K, riboflavin, and folate. Vitamin C is a powerful antioxidant that is necessary for the production of collagen and elastin, which strengthen arteries, bones, teeth, cartilage, and other tissues. It also helps the body to absorb iron, lowering blood pressure and cholesterol. Vitamin B6 is found in variety of foods, but many older adults have inadequate quantities in their system due to limited food variety in their diet. B6 is a water-soluble vitamin that performs many functions including helping to maintain blood sugar, aiding protein metabolism, and supporting the immune system. Vitamin B6 deficiency may increase levels of homocysteine in the blood. Elevated homocysteine levels have been identified as an independent risk factor for stroke and heart disease. CoQ10 is an antioxidant which protects the cell membranes and mitochondria. Mitochondria are the structures in the cells where most of the cells' energy is produced. The diseases commonly associated with aging are often referred to as "mitochondrial disorders." Coenzyme Q10, taken as a supplement, is incorporated into the cells throughout the body (including the brain), where it regulates the oxidation of fat and sugar into energy. In a study published in the Proceedings of the National Academy of Sciences (1998; 95) even short-term supplementation with moderate amounts of CoQ10 produced profound anti-aging effects in the brain. Few nutritional supplements can boast as many potential benefits as Grape Seed Extract. It is a powerful antioxidant that acts as point of contact between water-soluble antioxidants such as Vitamin C and fat-soluble antioxidants such as Vitamin E. By protecting and enhancing the functions of other vitamins, Grape Seed Extract may also aid in the reduction of wrinkles and vision problems. Recently, researchers have discovered that Grape Seed Extract can help defeat the hormone dihydrotestosterone (DHT) that stops the hair follicle growth cycle thereby stimulating healthy hair growth. Reduces effects of aging; Provides body with nutrients that are at lower levels after 30 years of age. Assists in releasing human growth hormones; Boosts energy levels. Improves muscle gain; Decreases muscle pain, spasms, and cramps; Reduces painful swelling. Aids in weight loss (decreases fat, increases muscle, supports proper metabolism). Aids mental functioning (concentration, memory, perception). Improves circulation (increases supply of oxygen to the heart, brain and other vital areas of the body). Helps stabilize blood sugar; Helps decrease blood cholesterol. Helps lower blood clots in veins and strengthens weak blood vessels; Helps lower blood pressure. Helps skin look youthful; Fights against wrinkles; Helps heal damaged tissue and wounds. Helps protect the heart; Helps to protect vision (eyes). Helps with erectile problems (increases blood flow). Helps fight against hair loss. Protects cells from free radical damage (powerful antioxidant). Enhances the immune system (increases T-cells); protects red blood cells. Protects lymphatic and digestive system. Aids in building new bone and tendon cells. Helps to detoxify the body (liver) from the harmful effects of alcohol, smoking, drugs, and heavy metals. 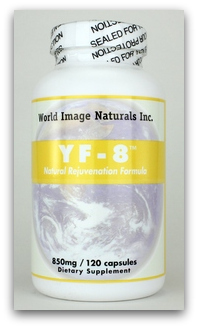 YF-8™ is a combination of eight supplements that work together to provide an effective anti-aging, Youth Formula (YF). Its unique, natural formula promotes health and youthfulness in the body without any synthetic or harmful stimulants or ingredients. It is encapsulated in pure vegetable capsules, which dissolve easily for maximum absorption, and does not contain any additives. How is YF-8™ Different from Other Products? We Tell You What is in Our Product! World Image Naturals™ YF-8™ - Experience the Difference! Suggested Use: Four capsules - 30-day supply in each bottle.